South of Eyüp is the area of Ayvansaray. 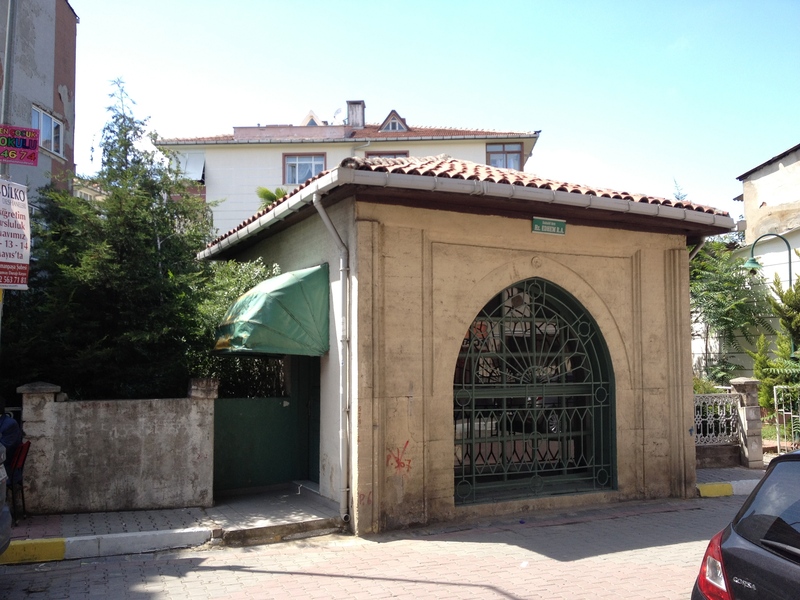 In this quiet residential neighborhood lie a number of tombs, but for this post we will focus on three noteworthy sites located by the Ayvansaray Coast along the waters of the Golden Horn. 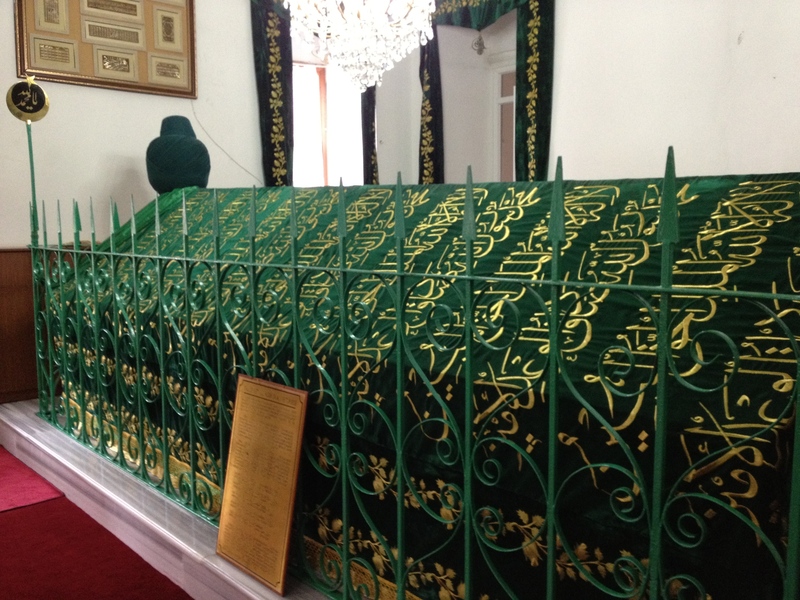 They are the tombs of Muḥammad al-Anṣārī (Muhammed el-Ensari), Abū Dharr al-Ghifārī (Ebuzer Gifari), and Jābir b. ‘Abd Allāh (Cabir bin Abdullah). 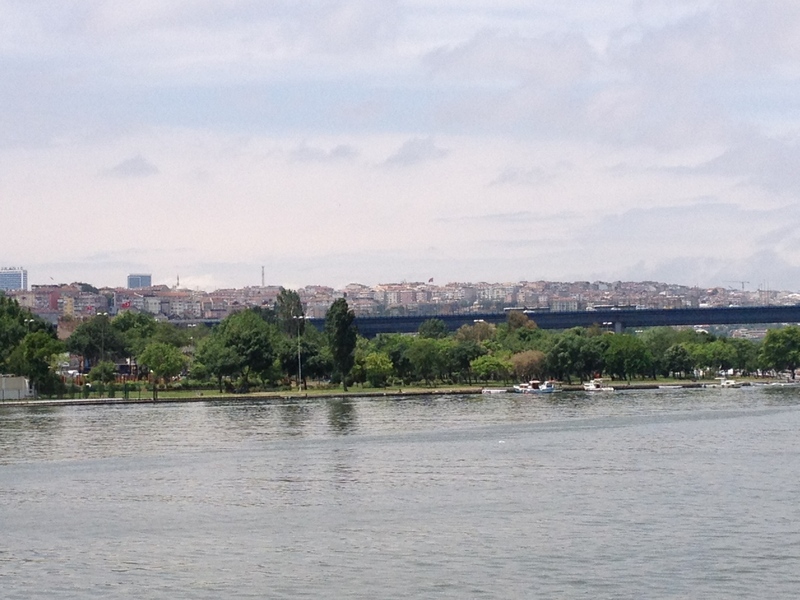 Yavedud Caddesi, a major thoroughfare, runs south out of Eyüp and passes beneath the towering Estuary (Haliç) Bridge. 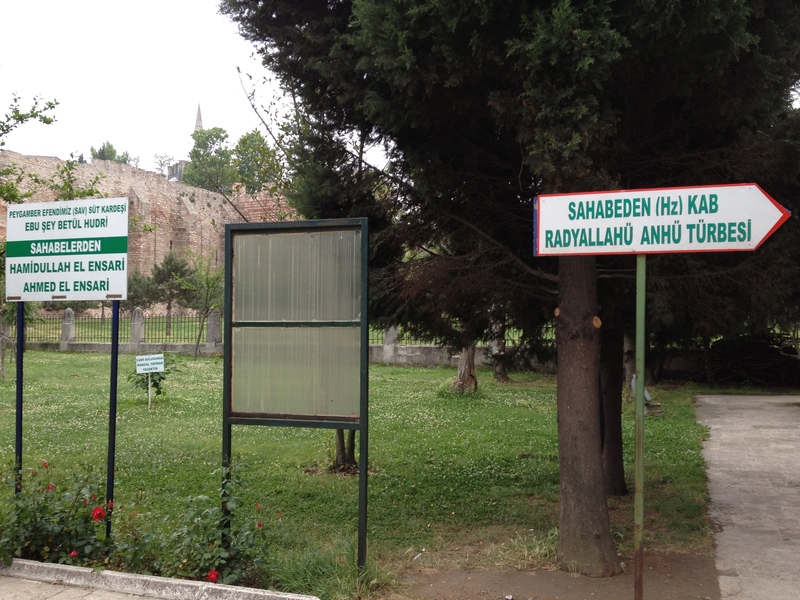 The road then becomes Ayvansaray Caddesi as it runs by the shrine complex in front of the old city walls, which we discussed in Part . 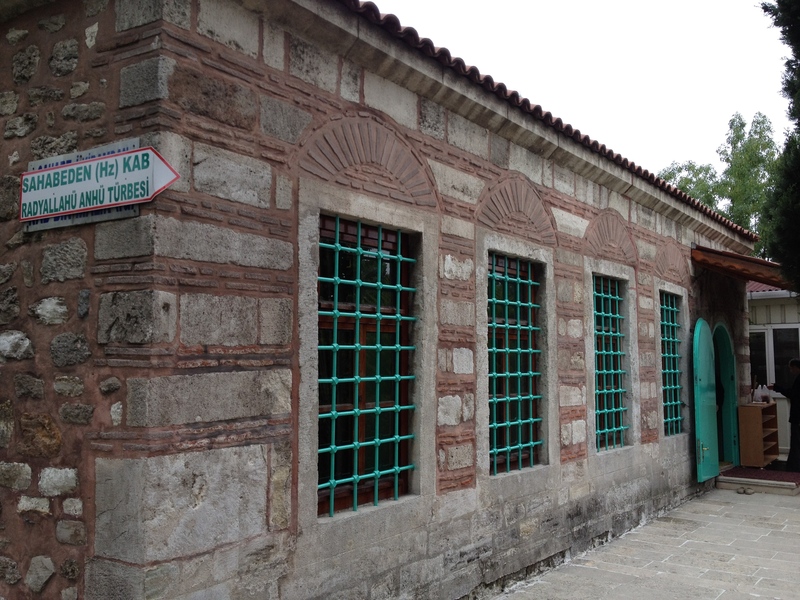 A block beyond the complex is a one-story building on the side of the street that houses the grave of Muhammad al-Anṣārī. 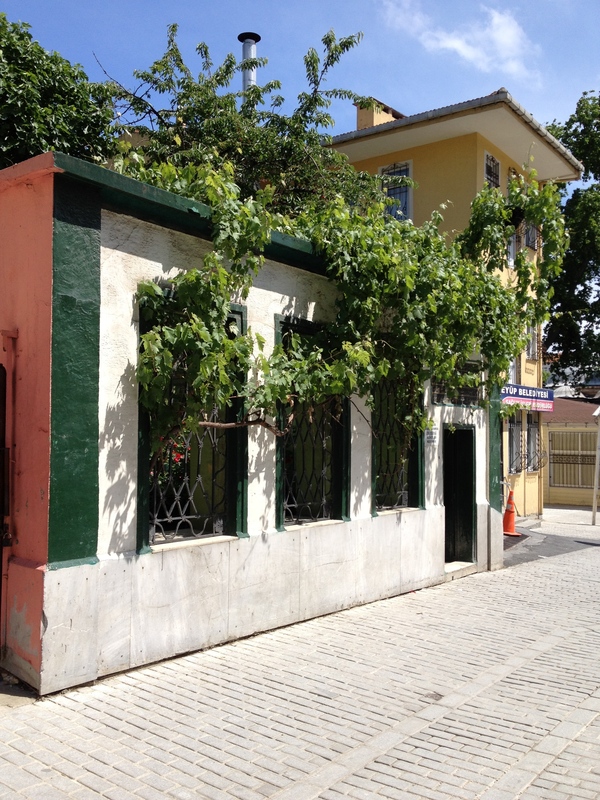 The site can also be reached by ferry by disembarking from the Ayvansaray ferry station and cutting through the green space of Haliç Parkı. 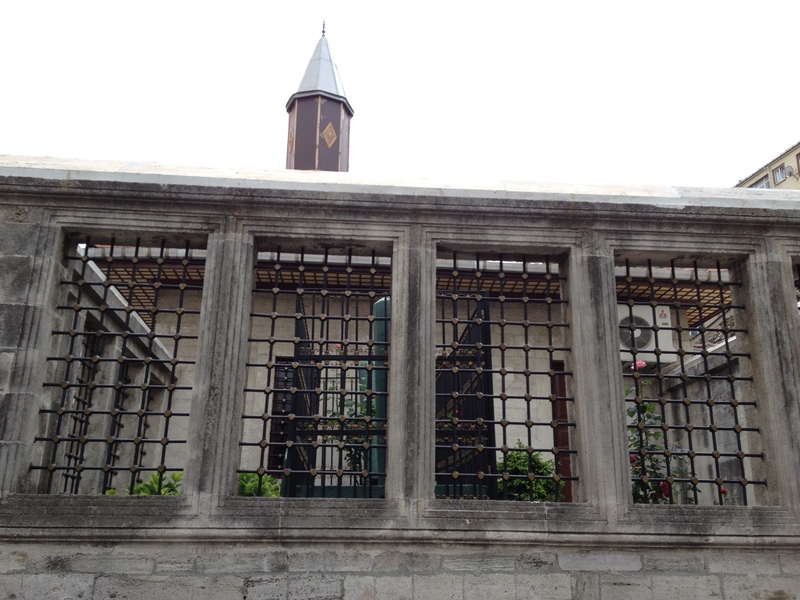 The white stone building is just on the other side of Ayvansaray Caddesi. The grave can be seen through a large window and should be open to the public for visitations. Like the previously discussed Abū Aḥmad al-Anṣārī and Ḥamīd Allāh al-Anṣārī, it is difficult to confirm the precise identity of Muḥammad al-Anṣārī given the fairly generic names provided. Nonetheless, one person of the many possible Companions of the Prophet presents himself as a strong candidate, Muḥammad b. Maslama al-Anṣārī (d. 43/663). He appears in numerous accounts as participating in many of the raids and campaigns of the early Muslim community and was personally sent by the Prophet on a number of occasions. Biographies consistently note his slaying of Ka’b b. al-Ashraf. After the Prophet’s death, Muḥammad b. Maslama appears to have served both the Caliphs ‘Umar and ‘Uthmān while avoiding the civil strife (fitna) that ensued afterwards. There are conflicting reports, however, about the date of his death, although all the sources agree that he died in Medina rather than the Byzantine frontier. Al-Ṭabarī, under the year 43 AH, reports, “In Ṣafar of this year (May 15 – June 12, 663) Muḥammad b. Maslamah died in al-Madinah. Marwān b. al-Ḥakam led the prayers over him” (al-Ṭabarī, History, 18:32). Ibn Sa’d reports his death in Ṣafar of the year 46 AH and also states that Marwān b. al-Ḥakam led the funeral prayer (Ibn Saʿd, Kitāb al-Ṭabaqāt al-kabīr, 3:410). The sources agree that Muḥammad b. Maslama was 77 years old when he died. Finally, Ibn ‘Abd al-Barr reports both the preceding dates of death and then adds the year 47 AH as a third possibility (Ibn ʿAbd al-Barr, al-Istīʿāb, 3:1377). 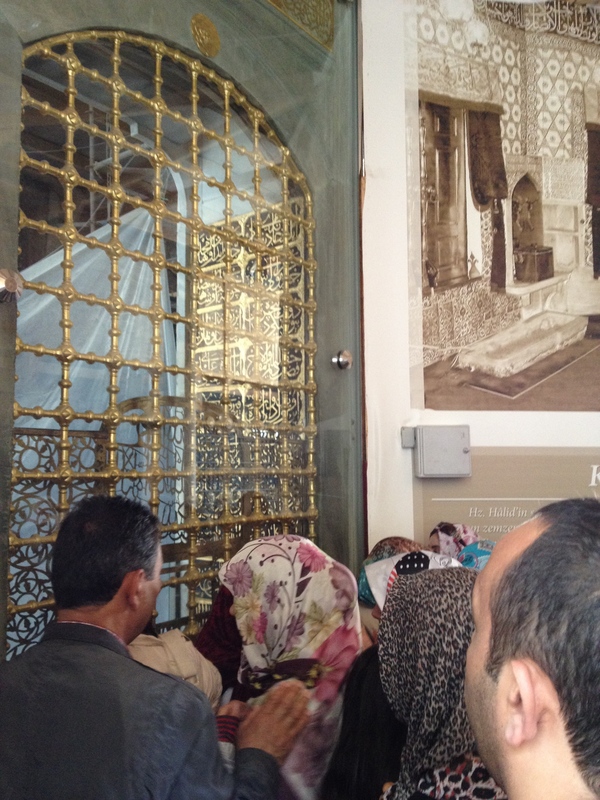 Given his widely reported death in Medina, it is possible that another Muḥammad al-Anṣārī rests here. Next, the mosque of Abū Dharr al-Ghifārī (d. 32/652-3), appropriately named Hazreti Ebuzer Gifari Camii, lies further inland. 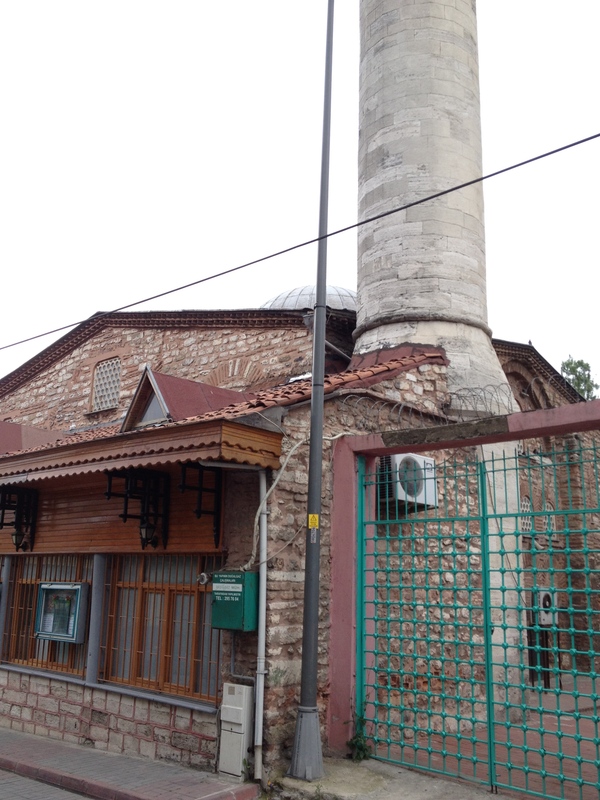 Several winding and uneven blocks away from Ayvansaray Caddesi where the tomb of Muḥammad al-Anṣārī lies sits this modest house of worship. 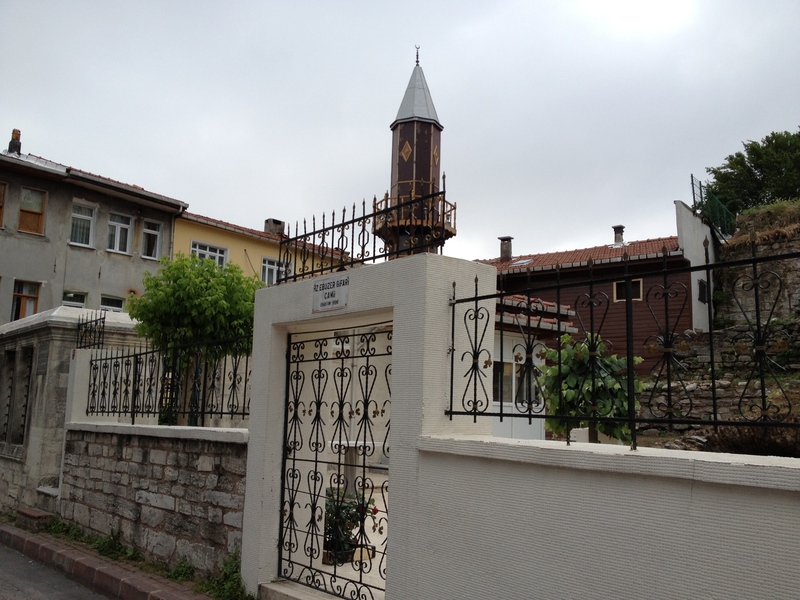 Adorned with a single minaret, the mosque is enclosed by a low wall topped with an ironwork fence. 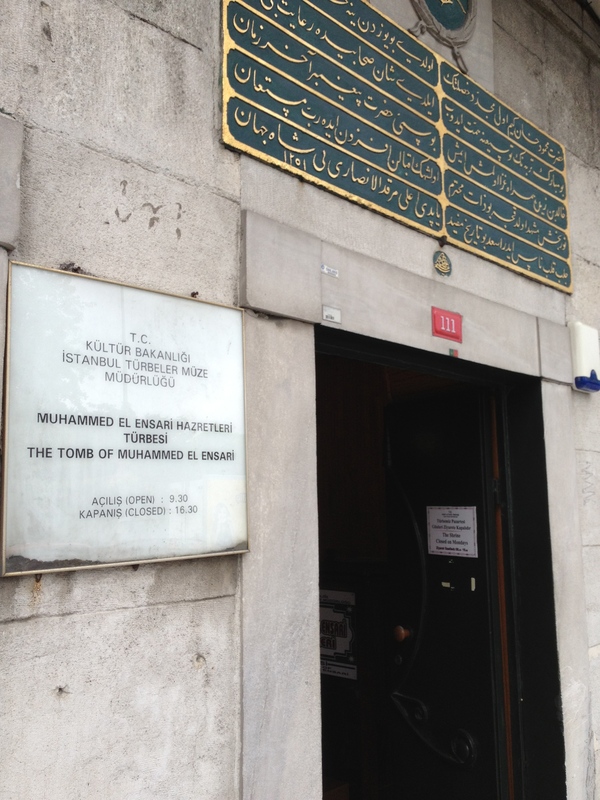 The actual tomb rests outside of the mosque lying beneath the open sky and is easily visible from the sidewalk. Abū Dharr al-Ghifārī, a Companion of Muḥammad. His name is commonly given as Djundub b. Djunāda, but other names are also mentioned. He is said to have worshipped one God before his conversion. When news of Muḥammad reached him he sent his brother to Mecca to make enquiries, and being dissatisfied with his report, he went himself. One story says he met Muḥammad with Abū Bakr at the Kaʿba, another that ʿAlī took him secretly to Muḥammad. He immediately believed, and is surprisingly claimed to have been the fifth (even the fourth) believer. He was sent home, where he stayed till he went to Medina after the battle of the Ditch (5/627). Later he lived in Syria till he was recalled by ʿUthmān because of a complaint against him by Muʿāwiya. He retired, or was sent, to al-Rabadha, where he died in 32/652-3, or 31. He was noted for humility and asceticism, in which respect he is said to have resembled Jesus. He was very religious and eager for knowledge, and is said to have matched Ibn Masʿūd in religious learning. He is credited with 281 traditions, of which al-Bukhārī and Muslim rendered 31 between them. “The owner of this abode will not leave us in it,” replied Abū Dharr. 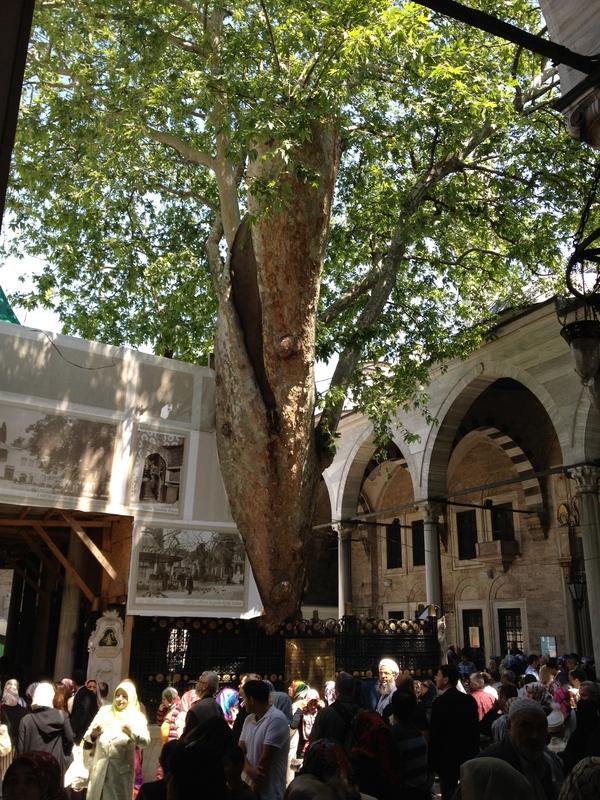 While it appears that Abū Dharr al-Ghifārī died in al-Rabādha, a Muslim settlement in Western Arabia that later went into decline, it is clear that his religious significance continued to have great weight amongst the Ottomans of Istanbul to warrant a tomb there. 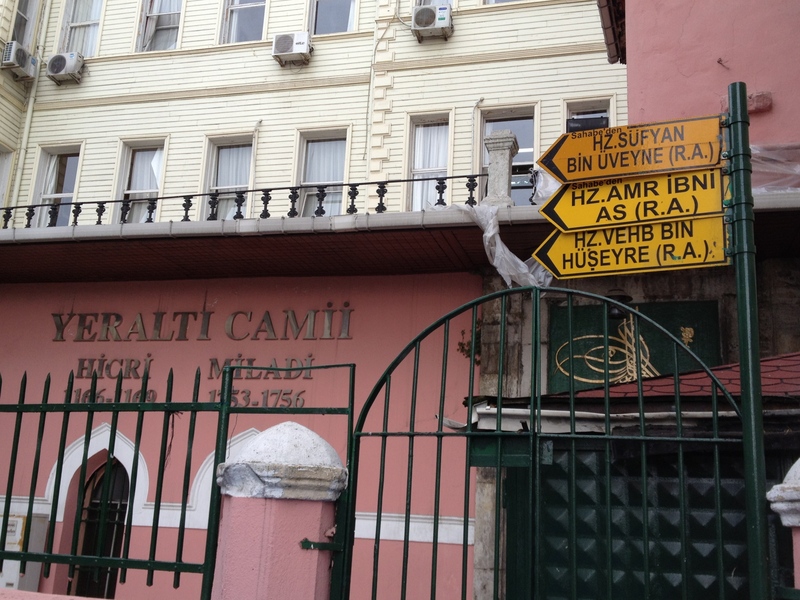 Swinging back towards the shores of the Golden Horn just two blocks away from Ebuzafer Camii and a block from Haliç Parkı is another mosque, Hazreti Cabir Camii. 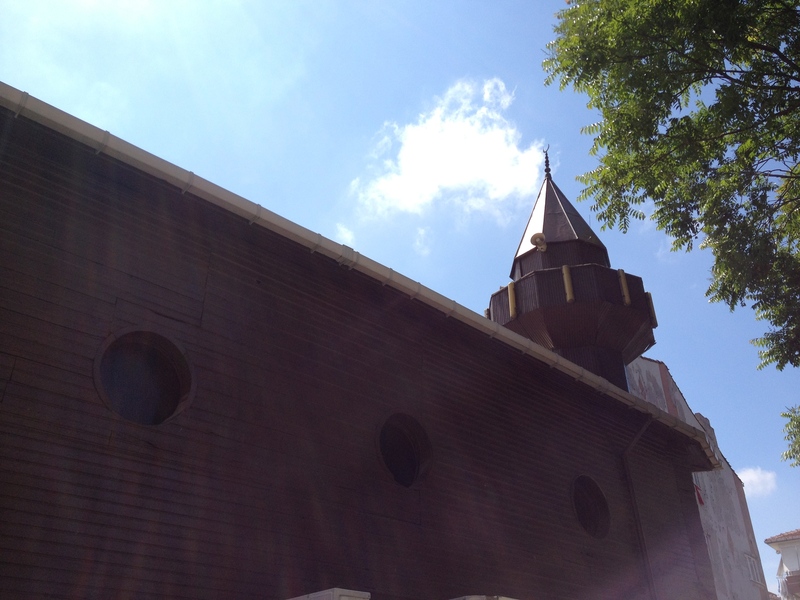 This small structure is easily recognized with its simple, white minaret and wood-paneled front. 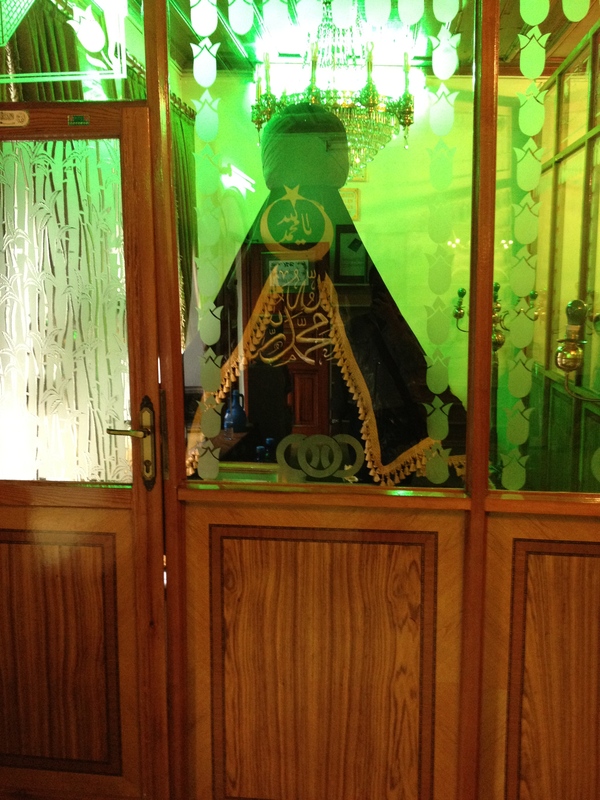 Inside the mosque and located off to the side in the main prayer space is the tomb of Jābir b. ‘Abd Allāh (d. 78/697). The grave lies hidden behind a dark green velvet curtain that is further barred by a golden gate. Djābir died at 78/697 at the age of 94 (other reports, however, give varying dates). He is said to have been the last survivor of the group of 70 Anṣār who attended the ʿAḳaba Meeting, thus fulfilling a prediction of the Prophet. 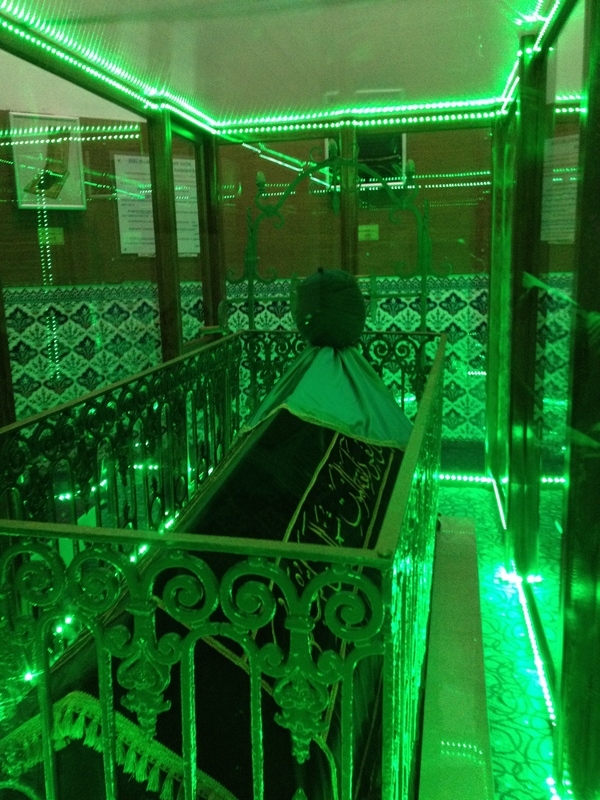 The prayer over his grave was performed by the governor of Medina, Abān b. ʿUthmān, or according to another tradition, by al-Ḥadjdjādj b. Yūsuf when he came to Medina after his victory over ʿAbd Allāh b. al-Zubayr. In Shīʿī tradition, Djābir was granted an exceptionally high rank. The ḥadīths recorded in Shīʿī sources on his authority touch upon the fundamental tenets of Shīʿī belief: the mission of ʿAlī, his qualities, his authority over the believers, the graces granted him by God, the divine virtues of his descendants and the duties of allegiance and obedience incumbent upon the believers. It was the imām al-Bāḳir who asked Djābir about the Tablet which God sent down to Fāṭima and which Djābir got permission to copy. In this Tablet God named the imāms and established their order of succession. It is noteworthy that, according to some versions, the imām compared the copy of Djābir with the Tablet in his possession and stated that the copy is a reliable and accurate one. In another story, Djābir confirms the accuracy of the unusual report about the hidjra as told him by the imām. Djābir is credited with the ḥadīth about the appointment of ʿAlī as waṣī, which forms the base of the Shīʿī interpretation of Sūra LIII, 1-4. It appears that Jābir b. ‘Abd Allāh, like Muḥammad b. Maslama and Abū Dharr al-Ghifārī who preceded him, likely passed away far from the environs of Constantinople. Nevertheless, these modest grave sites scattered along the Ayvansaray Coast continue to attest to the sustained attention and devotion that the remembrance of these Companions command. Hāmid, AbdulWāhid.1998. Companions of the Prophet, New Revised Edition. 2 vols. London: MELS. Ibn ʿAbd al-Barr. 1992. al-Istīʿāb fī maʿrifat al-aṣḥāb, 1st edition, 4 vols. Beirut: Dār al-Jīl. Muḥammad b. Saʿd al-Zuhrī. 2001. Kitāb al-Ṭabaqāt al-kabīr. 1st edition, 11 vols. Cairo: Maktabat al-Khānjī. Renard, John. 2009. The A to Z of Sufism. Lanham, UK: The Scarecrow Press, Inc. 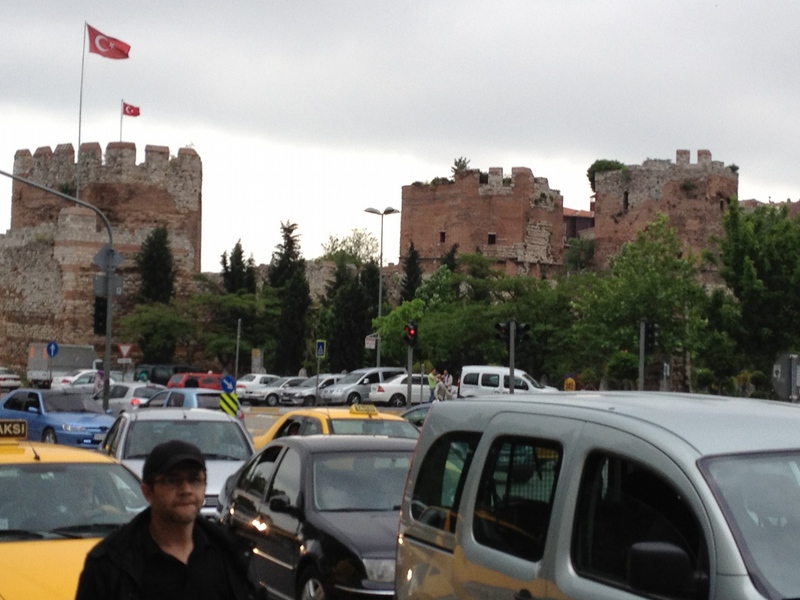 The city walls of Istanbul stretch from the Marmara Sea in the south to the Haliç or Golden Horn in the north. It is at the foot of these walls that a large number of Companions are reportedly buried. 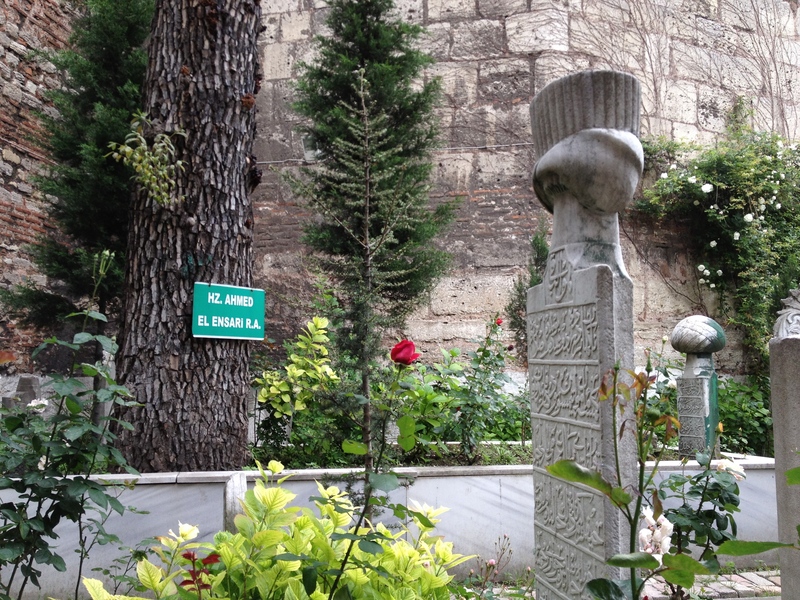 In this fourth post we visit four graves collected together just outside of the section of the wall that is located by the waters of the Golden Horn in a shrine complex lying between the neighborhoods of Eyüp and Ayvansaray. The tombs therein are those of Abū Shayba al-Khudrī (Ebu Şeybet ül-Hudri), Abū Aḥmad al-Anṣārī (Ebu Ahmed el-Ensari), Ḥamīd Allāh al-Anṣārī (Hamidullah el-Ensari), and Ka’b (Kab). 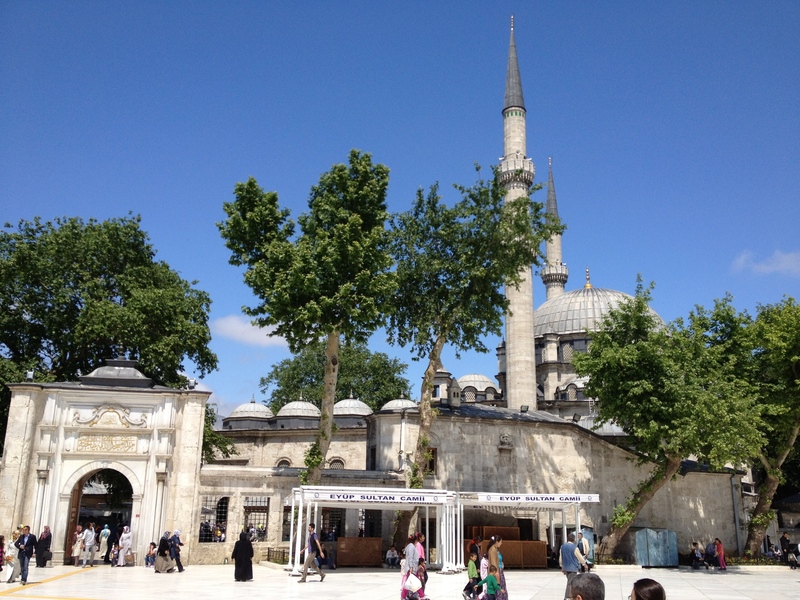 It is a brief 15-20 minute walk down from Eyüp or a single stop on the ferry, which runs up and down the Golden Horn. 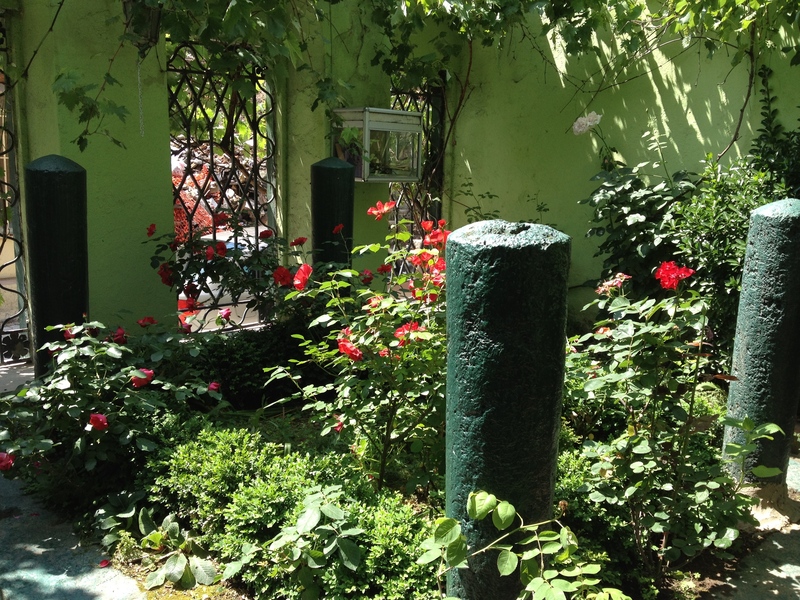 Upon entering the gardened complex there is a separate stone building off to the right that shelters the grave of Ka’b. 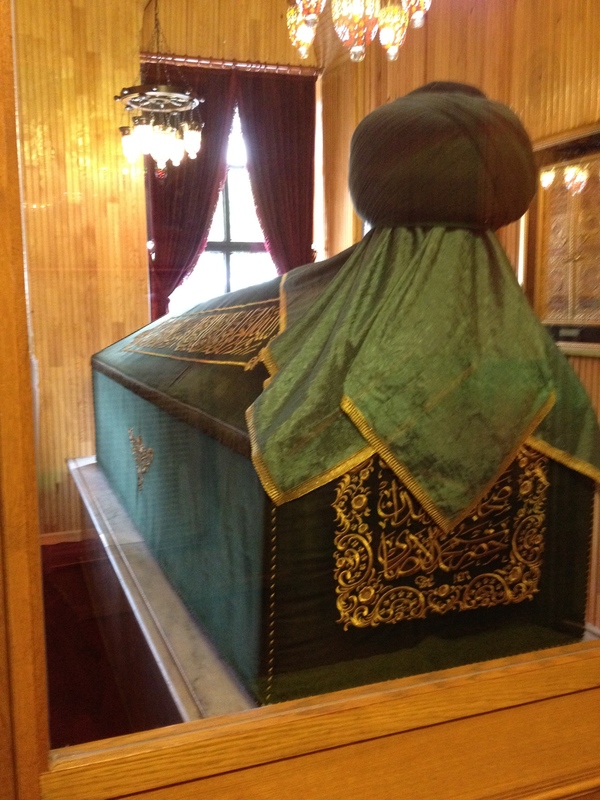 One can enter to see the tomb housed between an edifice of wood and glass. 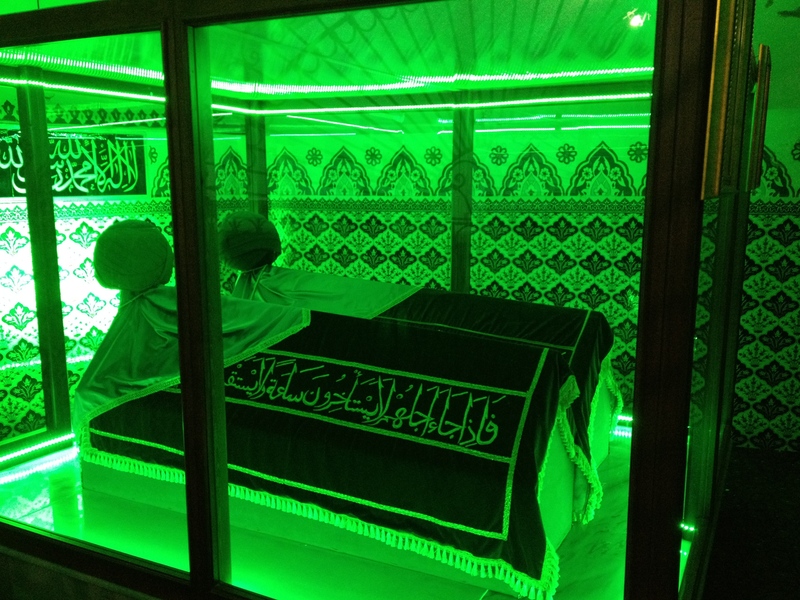 The tomb of Ka’b appears to have once been located inside Yavedud Camii, a nearby mosque, but was moved at some point to its present location in the shrine complex. As for the Ka’b resting therein, it is entirely unclear which Ka’b is intended. It appears then that Abū Shayba al-Khudrī was indeed amongst the Companions that came to and died before the city walls of Constantinople. 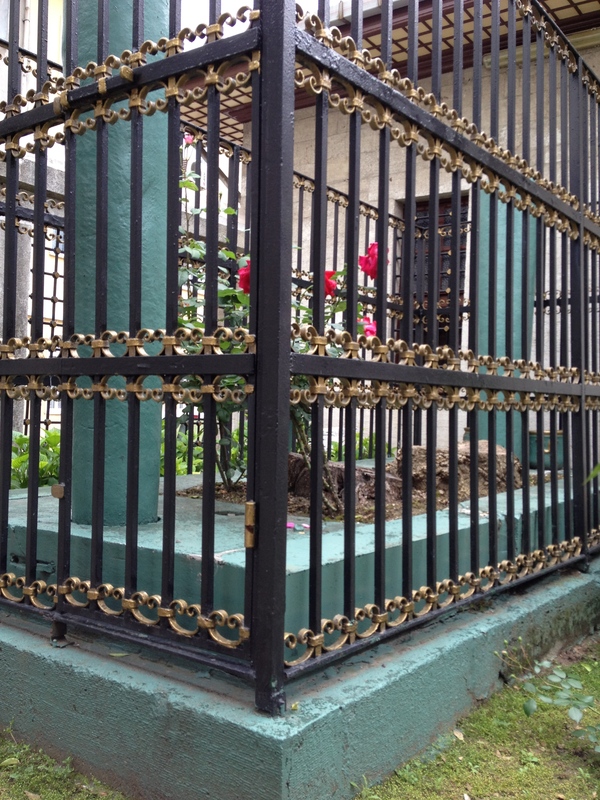 Across from the tomb of Abu Shayba al-Khuḍrī and laying out in the open air is the grave of Abū Aḥmad al-Anṣārī. The grave is easily recognized given the great tree that grows forth from his resting place and the well marked sign hanging above. Unfortunately, I was unable to obtain any biographical information for Abū Aḥmad. Any assistance would be appreciated. 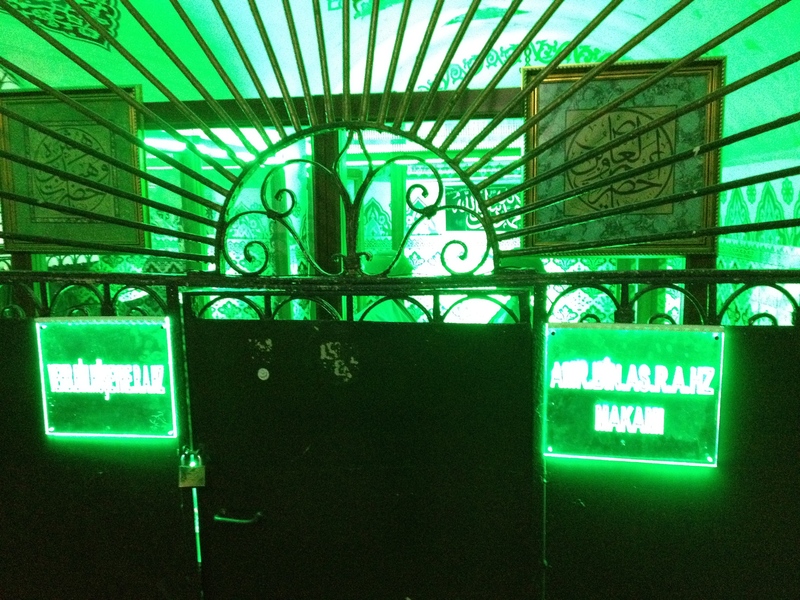 Just around the corner and in the same building containing the tomb of Abu Shayba al-Khuḍrī is another room with the tomb of Ḥamīd Allāh al-Anṣārī (the provided Turkish appellation of Hamidullah el-Ensari is somewhat ambiguous in terms of determining its Arabic equivalent). It is possible that the person meant is Ḥumayd b. Nāfiʿ. Ibn Saʿd (d. 230) mentions that he was a client (mawlā) of Abū Ayyūb al-Anṣārī adding, “He transmitted on the authority of Abū Ayyūb and went on Ḥajj with him” (Ibn Saʿd, Kitāb al-Ṭabaqāt al-kabīr, 7:300). Ḥumayd’s place of death, however, is not given. Crowley, Roger. 2005. 1453: The Holy War for Constantinople and the Clash of Islam and the West. New York: Hyperion. Ibn Ṣalāḥ al-Shahrazūrī. 2006. An Introduction to the Science of Ḥadīth: Kitāb Maʿrifat al-anwāʾ ʿilm al-ḥadīth. Translated by Eerik Dickinson. Reading: Garnet Publishing. Kandhlawi, Muhammad Yusuf. 1989. Hayatus Sahabah: The Lives of the Sahabah, 2nd edition, 2 vols. 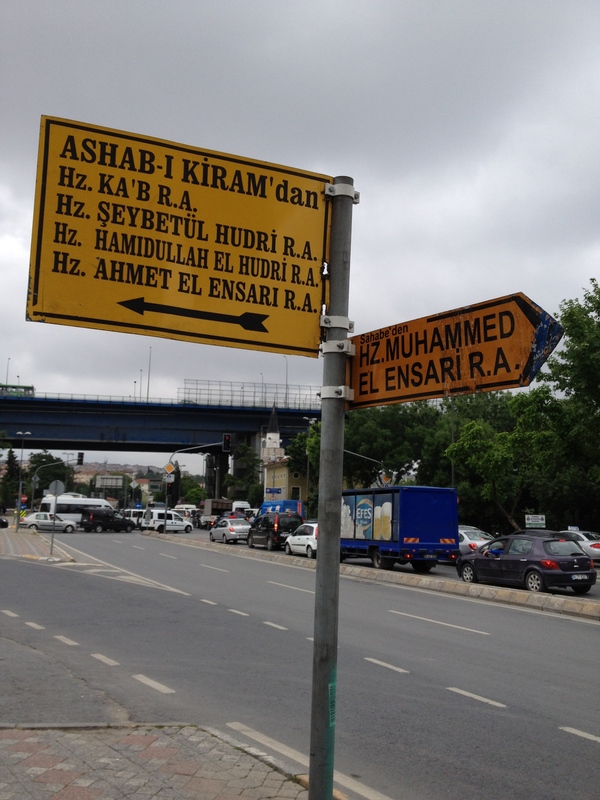 New Dehli: Idara Isha’at-e-Diniyat, Ltd.
For the second post of this series (Part 1) we turn momentarily from Eyüp to cover perhaps the best known tombs after that of Abū Ayyub al-Anṣārī. 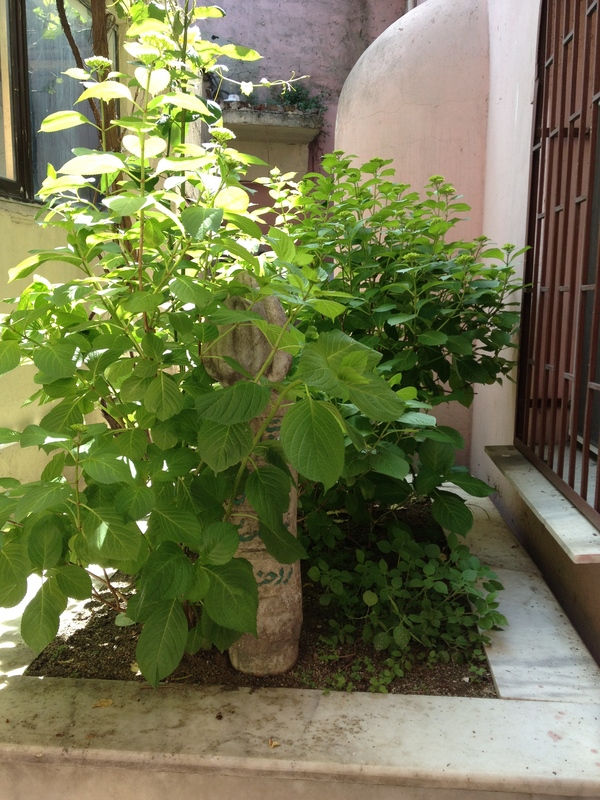 The site is located in Galata in the Yeraltı Camii or the Underground Mosque, a site previously mentioned in our treatment of Strolling Through Istanbul. For the sake of this post, I will proceed as if the persons ascribed to the tombs in the Underground Mosque are in fact the ones designated in the presently found signs. Yazīd b. Abū Ḥabīb from Raṣhid client of Ḥabīb b. Abū Aus al-Thaqafī from Ḥabīb told me that ‘Amr b. al-‘Āṣ told him from his own mouth: When we came away from the trench with the mixed tribes I gathered some of Quraysh together, men who shared my opinion and would listen to me, and said: ‘You know that in my opinion this affair with Muhammad will go to unheard-of lengths and I should like to know what you think of my opinion. I think that we ought to go to the Negus and stay with him. If Muhammad conquers our people we shall be with the Negus and we should prefer to be subject to his authority rather than to Muhammad; on the other hand, if our people get the upper hand they know us and will treat us well.’ They thought that my suggestion was excellent so I told them to collect something that we could take as a present to him; as leather was a product of our land which he most valued we collected a large quantity and took it to him. While we were with him who should come to him but ‘Amr b. Umayya al-Ḍamrī whom the apostle had sent concerning Ja’far and his companions. He had an audience with the Negus, and when he came out I said to my companions that if I were to go to the Negus and ask him to let me have him, he would give him to me and we could cut off his head; and when I had done that Quraysh would see that I had served them well in killing Muhammad’s messenger. So I went to the Negus and did obeisance as was my wont. He welcomed me as a friend and asked if I had brought anything from our country, and when I told him that I had brought a large quantity of leather and produced it he was greatly pleased and coveted it. Then I said, ‘O King, I have just seen a man leave your presence. He is the messenger of an enemy of ours, so let me have him that I may kill him, for he has killed some of our chiefs and best men.’ He was enraged, and stretching out his hand he gave his nose such a blow that I thought he would have broken it. If the earth had opened I would have gone into it to escape his anger. I said that had I known that my request would have been distasteful to him I would not have made it. He said, ‘Would you ask me to give you the messenger of a man to whom the great Nāmūs comes as he used to come to Moses, so that you might kill him!’ When I asked if he were really that great he said: ‘Woe to you, ‘Amr, obey me and follow him, for by Allah he is right and will triumph over his adversaries as Moses triumphed over Pharaoh and his armies.’ I asked him if he would accept my allegiance to Muhammad in Islam, and he stretched out his hand and I gave my allegiance. 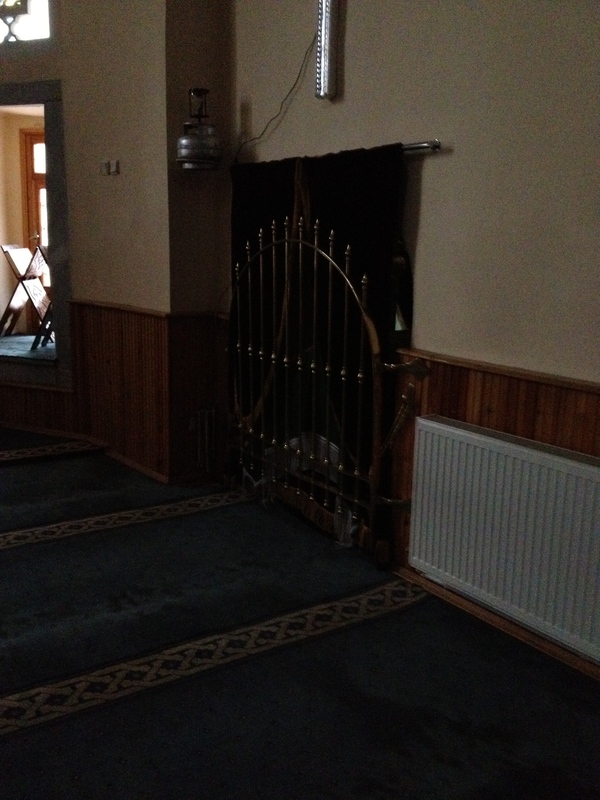 When I went out to my companions I had entirely changed my mind, but I concealed my Islam from my companions. As for Wahb b. Hushayra (if the ascribed name is correct) he appears to have been a minor Companion who partook in one of the early Umayyad attacks on Constantinople. As I have fallen short on sources, I would appreciate any references to his life or a reliable identification. Sufyān b. ‘Uyayna b. Abī ‘Imrān. His kunyah was Abū Muḥammad; he was a client of the Banū ‘Abdallāh b. Ruwayhbah, [a clan of] the Banū Hilāl b. ‘Āmir b. Ṣa’ṣa’ah. Sufyān’s father, ‘Uyaynah, was a functionary of Khālid b. ‘Abdallāh al-Qasrī. When Khālid was dismissed from [his office as governor of] Iraq and replaced by Yūsuf b. ‘Umar al-Thaqafī, the latter pursued Khālid’s functionaries, so they fled from him. ‘Uyaynah b. Abī ‘Imrān went away and settled in Mecca. According to Ibn Sa’d > Muḥammad b. ‘Umar [al-Wāqidī]: Sufyān b. ‘Uyaynah told me that he was born in the year 107 [725-6]. He had pursued knowledge at an early [age] and became a ḥāfiẓ. He lived a long life, until his peers died and he outlived them. Sufyān related: I went to the Yemen in the years 150 [767-8] and 152 [769-70] while Ma’mar [b. Rāshid] was still alive. [Sufyān] al-Thawrī preceded me [there] by a year. 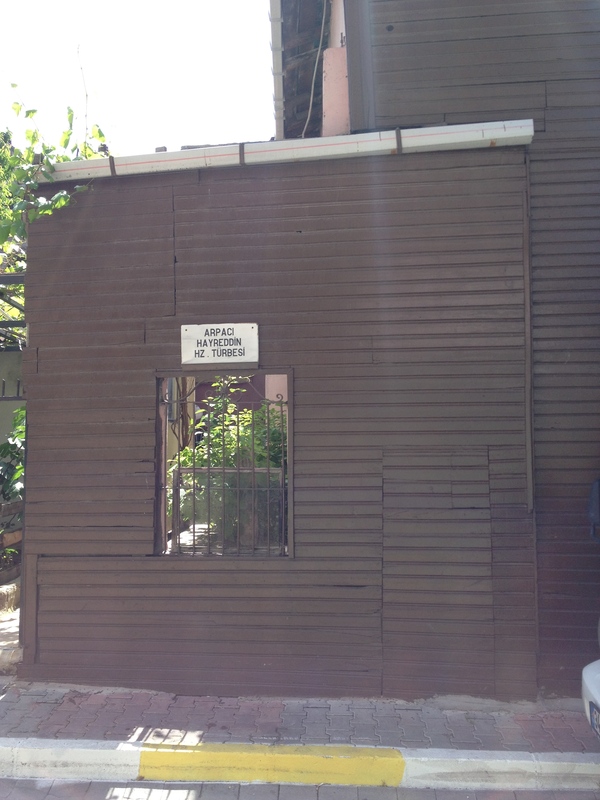 Erkal, Namık. 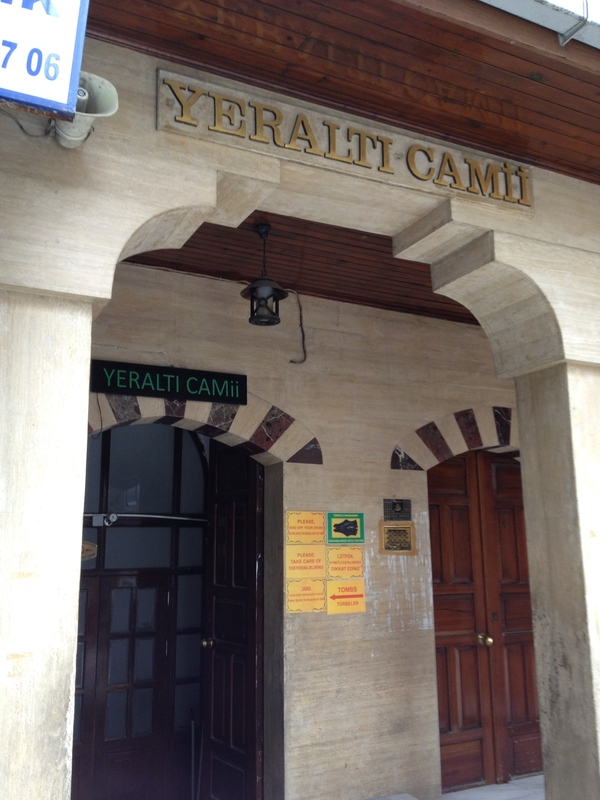 “The Corner of the Horn: An Architectural Review of the Leaded Magazine in Galata İstanbul.” Middle East Technical University (METU) Journal of the Faculty of Architecture 28.1 (2011): 197-227. Hasluck, F.W. Christianity and Islam Under the Sultans, Volume I and II. Oxford: Clarendon Press, 1929.